Hughie Thomasson (August 13, 1952 - September 9, 2007) was an American guitarist and singer. He was a member of the bands Outlaws and Lynyrd Skynyrd. ↑ Flippo, Chet (September 11, 2007). 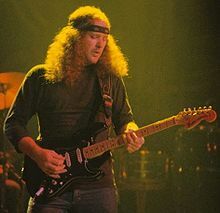 "Southern Rock Pioneer Hughie Thomasson Dies in Florida Guitarist Founded the Outlaws and Later Joined Lynyrd Skynyrd". CMT News. 2010 MTV Networks. Retrieved 28 November 2014. This page was last changed on 5 March 2015, at 00:10.